The New Year is still waiting for its first rain. The driest January on record is coming to a close, with one thing in common from Jan. 1 to today: no rain. No rain fell on San Francisco this month at all. That's a bone dry, rain-less January for the first time in San Francisco history, according to reports. The Huffington Post notes that snowpack in the Sierras, the predictor of whether or not reservoirs will fill up or be empty throughout the year, is "alarmingly low," some 20 inches below normal for this time of year. 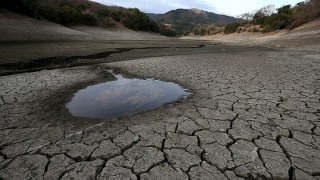 Statewide, January is shaping up to be the driest on record, according to state water watchers. In the Bay Area, December was wet indeed: over a foot of rain fell over much of the Bay Area.